Joburg2Kili Team photo just before we departed on our final leg cycling from Arusha to Moshi. 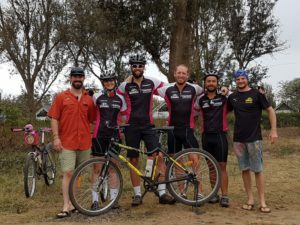 Yesterday we cycled our final leg of the #Joburg2Kili expedition from Arusha to Moshi at the base of Mount Kilimanjaro. 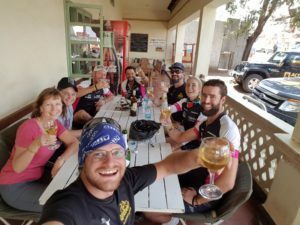 Since leaving Johannesburg at the end of July we have covered 4650km on our Qhubeka Buffalo Bicycles cycling through Botswana, Zambia, Malawi and Tanzania. It has been a truly incredible experience for us all with lots of ups and downs but to know that we have been able to do this to raise awareness and funds for the Qhubeka charity has made it all worthwhile. Our final 90km ride from Arusha to Moshi was definitely one to remember. 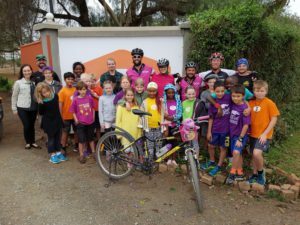 It was an overcast morning and we started our ride by visiting the International School of Moshi which is the school where the Dennis families’ children go. Some of the school kids came out to cheer us on and we had a quick stop to speak to them about our journey. From there we had to negotiate through some busy traffic and roadworks for about 20km. We had two mechanical issues to deal with on our final cycle. Cam’s bike-stand had lost a screw so her back wheel was getting caught in it whenever we went over rumbles on the road. So at the 20km mark the boys helped to fix the issue. Then about halfway into the ride Warrick had a blow out on his front tyre. His front brake somehow got caught in the tyre causing the tube to burst. Thankfully we didn’t have any more issues with the bicycles for the rest of the ride which was relatively downhill and flat to Moshi. 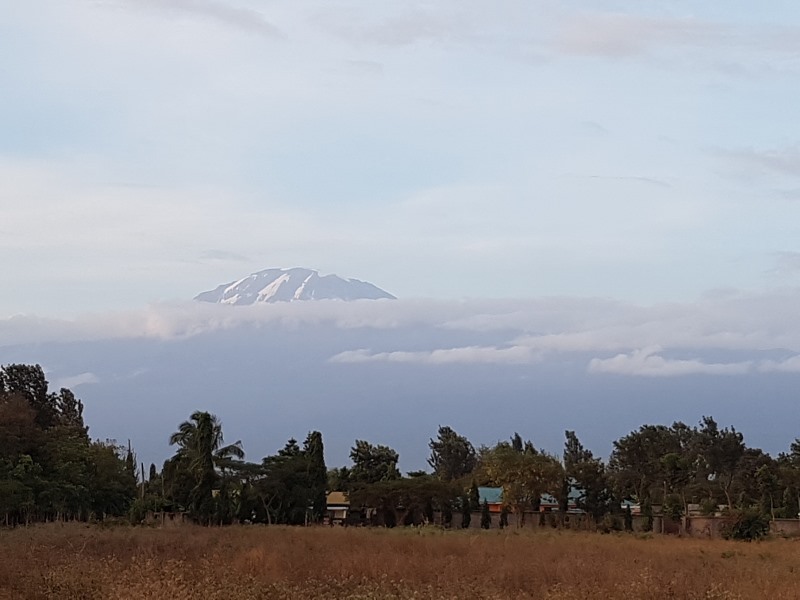 Unfortunately, as it was overcast we weren’t able to see Mt Kilimanjaro clearly on our final cycle to Moshi but we did get a glimpse of the peak when some clouds opened up. 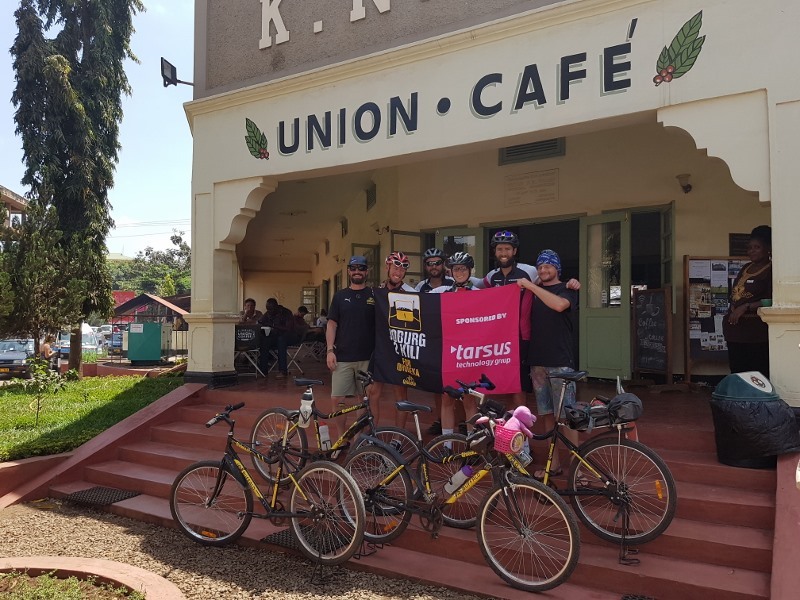 We managed to organise to finish our cycle into Moshi at the Union Café who work with our coffee sponsor TriBeCa. It was a perfect place to end our journey and to celebrate over a delicious lunch with some champagne and Amarula. 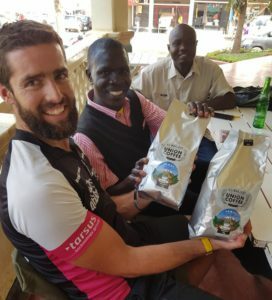 At Union Café we also met with our Mount Kilimanjaro guide, Gilbert, who works with the tour operator Soul Adventures. Warrick, Cam and Gareth will start their Mount Kilimanjaro climb on the Machame route on Monday 10th October. The trio plan to summit on the 15th October, which is The Kernes 5th wedding anniversary. They will be carrying the SPOT Gen3 GPS tracker with them so you can still track their progress on the Live Tracking page. Derrick has decided not to climb after having malaria a few weeks ago as it is a big risk for him to climb at high altitude. Bobby will be visiting a friend in Arusha for a few days before flying back to the USA via Amsterdam. Bryan will be going back to Arusha where he is looking at a few options. It has been an incredible journey for the whole team but what has made it extraordinary has been all the wonderful support we have received both in terms of donations for Qhubeka as well as words of encouragement along the way from our sponsors, family, friends and fans. We are all extremely grateful for this and would like to say a massive THANK YOU to you all.